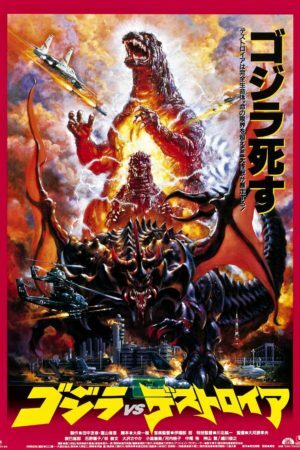 Godzilla vs. Destoroyah, from 1995, was literally advertised in Japan with the slogan "Godzilla Dies". But even if you didn't know that going in, it's a film that positively oozes fin de siècle gravitas and sincerity and gloom, making it very clear that whatever the story the film intends to tell, it will arrive at a point of intense, permanent change, and perhaps not for the better. (As for why Toho decided to kill off their cash cow: it was to clear the boards for a new American-made Godzilla franchise that was then just starting to rev up, with TriStar working busily on their own Godzilla that was eventually released in 1998. The idea was that a new Godzilla franchise made with all the resources of a Hollywood studio would be an even bigger international hit than the good old rubber suit Godzilla films; this plan backfired spectacularly, but that's a story for another day). The result is a Godzilla movie of particular grandeur and seriousness, certainly the most grim-minded entry in the series since director Honda Ishirō hung up his spurs, maybe even since the very first Godzilla of 1954, a film to which Destoroyah orients itself as an especially specific sequel. Like that film, the story hinges on humankind's capacity for making things worse through the overuse of technology that we haven't fully thought-through, whilst not-so-incidentally managing to make the tragic ending of that film even sadder: Dr. Serizawa having deliberately sacrificed himself in '54 to ensure the secret of his potentially world-ending oxygen destroyer would be kept away from a humanity far too prone to misusing such power, it now comes as something of a sucker punch to find that his sacrifice was in the end, only kicking the problem 42 years down the road: not only has some new scientist with more passion than common sense effectively re-invented the oxygen destroyer, we now learn that Serizawa's original had the unlooked-for side effect of birthing a giant creature even more devastating and horrifying than Godzilla itself - a monster ultimately named Destoroyah or Destroyah, depending on what year you saw the film in English; it's the only monster name not more cleanly transliterated for the unanswerable reason that Toho couldn't trademark the word "Destroyer". The film wastes absolutely no time, opening with Saegusa Miki (Odaka Megumi) on a helicopter, discovering to her horror that Birth Island, the Pacific home of Godzilla and its juvenile adopted child, simply no longer exists. Godzilla sure as hell still exists: it makes landfall in Hong Kong and wreaks havoc, looking quite freakish and wrong in the process: huge parts of its body are glowing red, as are its eyes, and its atomic breath has become hotter and shifted from blue to orange. All this in a pre-title sequence, I believe the first one in the series; and that alone says something about how much we need to shift our expectations with this one, n'est-ce pas? Only one person in the world seems to have any explanation for this freakish, abrupt shift, and he's a college student: Yumane Kenichi (Hayashi Yasufumi), the adopted grandson of the legendary scientist Yamane Kyohei, who was such an important figure in the first Godzilla attack back in the '50s. Kenichi's theory is that Godzilla doesn't have a heart in the traditional sense, but that it's essentially powered by an internal nuclear reactor. And based on the recent evidence, it appears that reactor is about to have a meltdown of enough severity that a huge portion of the planet will be wiped out in the blink of an eye when it happens, to say nothing of the fallout that will afflict the straggling creatures on the opposite side of the globe who managed to live through the initial explosion. Kenichi thus comes to the attention of G-Force, but he's not the only researcher making huge strides in the science of Godzilla. Dr. Ijuin Kensaku (Tatsumi Takuro) has lately stumbled across a formula for "micro-oxygen", an agent that works on much the same principles as the late Serizawa's oxygen destroyer. The thought of bringing such a nightmarish project back to humanity is of no pleasure to Kenichi, his reporter sister Yukari (Ishino Yoko), or their aunt Emiko (Kochi Momoko, cameoing as the character she played all those decades earlier) - Serizawa's fiancé, lest we forget - who have a whole family identity centered around the unspeakable evil of oxygen-based weaponry, Kensaku soldiers on with his research, when he discovers something horrible: the '54 oxygen destroyer event changed the soil enough that some unfathomably ancient dormant life-form, something like a microscopic Precambrian crustacean, has been brought back to life, and several individual organisms manage to escape to an aquarium near Kensaku's lab, where they grow to human size. Those creatures, by the way, are just about the most horrifying kaiju ever seen on film, hideous Giger-esque collisions of horns and chitinous flesh and penile inner mouths that come so close to the Alien monster, with so little intent to hide it, that I'm kind of amazed no lawsuits came of it. Eventually, Godzilla, the long-missing Godzilla Junior (this film's official name for the creature previously called Baby Godzilla and Little Godzilla), and the Precambrian monsters, combining themselves into a single hideous bat-crab monstrosity dubbed Destoroyah, all converge on Tokyo, G-Force throwing everything they have at the monsters in a desperate battle to stop them; key to these efforts is a new cryo-gun that might be able to freeze Godzilla solid and stop its planet-destroying meltdown. This results in, naturally, the most self-consciously operatic and violent battle in any Godzilla film to date. And it's really violent. The scene in which Destoroyah attacks Godzilla Junior is genuinely shocking and upsetting, as the hellbeast uses its giant clawed mouth to rip a huge hole in the young monster's chest, which geysers up blood that leaves Destoroyah's mandibles shining red in the light of all the fires that the fighting has caused. It's horror, is what it is; the action of the rest of the VS Series is present, but this is genuine horror imagery above all else, and it lends Godzilla vs. Destoroyah a terrible weight and grandeur like nothing else in any of the Godzilla films of its generation. Especially the scene in which Godzilla itself dies, an overwrought and arguably silly exercise in fire and light and explosion with the skin literally melting off the monster's skeleton in front of our eyes. I wonder, perhaps, if all of this goes a little too far to extremes; wallowing in ugliness and brutality for the sake of cheating its way into gravity. But then, the death throes of Godzilla Junior are genuinely upsetting in a way that truly does elevate the film; it even elevates poor Miki, who never really paid off as a character in the six movies where she appeared, but whose ability to act as our conduit for being shocked and aggrieved by the actual death of a generally sympathetic kaiju justifies her presence in a way that the films have never managed to make stick. Director Okawara Takao and writer Ohmori Kazuki (the latter working with Godzilla for the last time) certainly deserve credit for the intensity and focus of tone they bring to bear (as does Old Reliable himself, Ifukube Akira; his score was the last he ever composed, and made up mostly of reheated cues, but he does have one new piece with an achingly earnest and simple orchestration, harsh and melancholy, that I completely adored), even if the film doesn't really work as a story any better than it has to: more than any Godzilla film in decades, it does feel like the scenario is just a conduit for getting us to moments of emotional impact, and I will confess to really liking that approach to a giant monster movie. At least in this case. The battles are also, I am inclined to say, the best since at least Godzilla vs. King Ghidorah, though it could be easily argued that they are over-long and messily edited; certainly nothing that follows Destoroyah's shockingly fast disposal of Godzilla Junior meets it for sheer visceral impact. But the massive drama and theatricality in the lighting and sale of destruction, along with the three absolutely terrific suits in play, end up having a lot of impact even if I'm sure we could all point to ways that things could be snugged up. And they are, mind you, beautiful suits: Godzilla Junior is perfectly proportioned, though also a regrettable shade of jade green; Destoroyah is a fantastic perversion of some of the nastiest animals on Earth, made to look like a genuine bat out of hell. And Godzilla's effects-heavy suit this time looks the best it has since Godzilla vs. Biollante, for my tastes: more frenzied-looking, especially with its crazed eyes and smoke pouring out of its body, and in his last performance as the monster (one that involved a lot of passing out, apparently), Satsuma Kenpachiro continued to find news ways to explore its body language and express a real delicacy and tenderness in its relationship to the broken Godzilla Junior. I would go so far as to say, not without some hesitation, that it's the best Godzilla film of the VS era: visually robust, focused on great heaving gestures and emotions that work so much better in this franchise than the attempts at human-scaled storytelling that some of the more recent sequels gestured towards. It flags its seriousness and desire to have an impact maybe a bit too eagerly, but the results are hard to argue with: it is a sufficiently epic finale for an iconic character, and our foreknowledge of how far awry things would go with the plan to bring a temporary close to the Japanese Godzilla saga shouldn't color just how bold and roiling that close succeeded in being, in its moment.